The purpose of this quantitative study was to develop and test a survey instrument to measure pre-service teachers’ Technological Pedagogical Content Knowledge (TPACK) framed by a transformative lens. The Survey of Teaching Knowledge with Curriculum-Based Technology was developed and administered to 124 pre-service teachers within the context of a required educational technology course taught at a large, Mid-Atlantic University. Survey data were analyzed using exploratory factor analysis (EFA). Results revealed evidence of two discrete domains: Knowledge of Technology and Knowledge of Teaching with Curriculum-Based Technology. The findings of this work provide support for a transformative approach to examining TPACK development. Findings have implications for researchers, educators, and teacher preparation programs. Yilmaz Ozden, S., Mouza, C. & Harlow Shinas, V. (2016). Teaching Knowledge with Curriculum-Based Technology: Development of a Survey Instrument for Pre-Service Teachers. 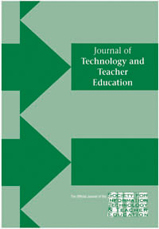 Journal of Technology and Teacher Education, 24 (4), 471-499. Waynesville, NC USA: Society for Information Technology & Teacher Education. Retrieved April 18, 2019 from https://www.learntechlib.org/primary/p/172178/. Fernandez, C. (2014). Knowledge base for teaching and pedagogical content knowledge (PCK): Some useful models and implications for teachers’ training. Problems of Education in the 21st Century, 60, 79-100. Gess-newsome, J. (2002). Pedagogical content knowledge: an introduction and orientation. In J. Gess-newsome & N. Lederman (eds. ), PCK and science education (pp. 3–17). New York: Kluwer academic Publishers. Kind, V. (2009) Pedagogical content knowledge in science education: perspectives and potential for progress. Studies in Science Education, 45(2), 169204.